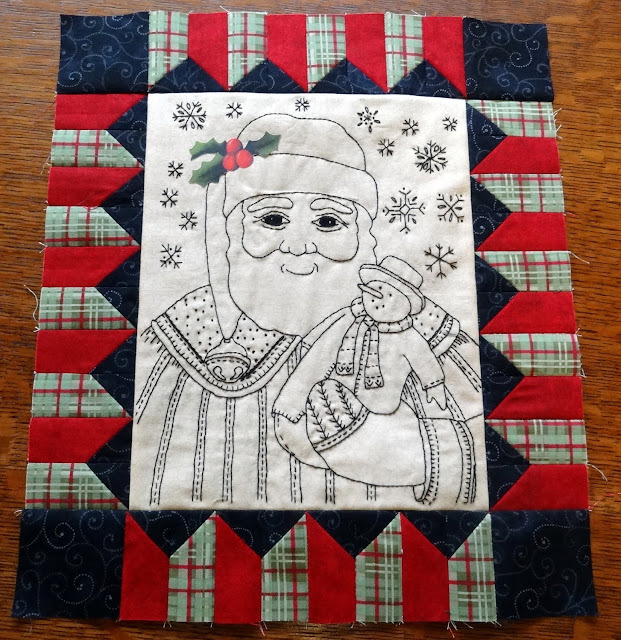 Squash House Quilts: Santa Finish! Happy Thanksgiving! I'm busy, busy painting barn quilts! The orders are FLOODING in but we are taking today & tomorrow off then it's back to work! My husband is helping me now...it's so nice having a 6'7" elf!!! Hope you & Mr. Squash have a fun weekend! Happy Thanksgiving to you and Mr. Squash and the girls. Enjoy your "dishes free" day! I think both you and the mister are lucky. :o) That is a gorgeous Santa! Have fun in Portland -- wish I was there too. I've enjoyed following your Kathy Schmitz blocks! Santa is Adorable ! Love your fabric choices and I can not wait to see what you have planned for the layout for this quilt. Have fun in Portland ! I seriously have to research Kathy Schmitz... I love your blocks and would have to say that this one is my favorite. Your stitches are amazing and the border is awesome! Happy Thanksgiving, Candace. I like your philosophy on dinner out. Very creative. And the block looks wonderful. I'm working on some blocks for Easter and spring that have lots of embroidery in them. Have a nice HOLIDAY! Don't give that turkey a second thought. Enjoy! Prime rib, anyone? Do tell us where you went for Thanksgiving dinner, though. See you. I just love your Santa. He looks so jolly, and the snowman he's holding is cute too. Happy Thanksgiving! and enjoy your mini vacation. I do like the fabrics you used on Santa. The Santa block is great, the little touch of colour is enough. Happy Thanksgiving to you and Mr Squash. Safe travels to PDX, one of my favorite cities! So, so pretty. I just love Kathy's designs and can't wait to see how you incorporate them into a quilt. Happy Thanksgiving to you, Mr. Squash and the girls. Your Santa is so cute, you are so talented. Hope you have a good trip to Portland. We came home a couple of days early so we don't get stuck on bad roads with the 5th wheel. Safe travels and big hugs! !